The Kami people live in three countries: India, Nepal, and Bhutan, but only in the latter country are there no believers among them. The Kamis are Nepalis resident in West Bengal, India, though some have migrated to nearby Bhutan. The Kami people are a rural people known for metal working. They are divided into two groups: black smiths and gold, silver, and copper smiths. They supplement smithing with agricultural work. About a third are literate in Nepali. Many are bilingual, also speaking Hindi. The Kamis are also found in southern Sikkim, mostly in rural areas. In those areas, they engage in agriculture. Others serve as curers, who favor traditional medicines over the use of modern medicine. 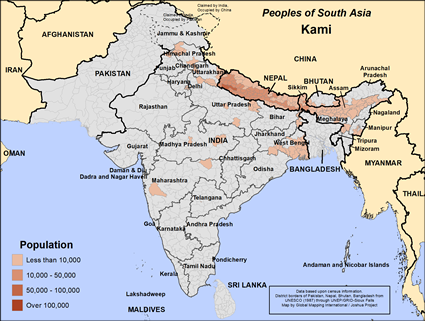 As a rule, Kamis are Hindus. They worship different Hindu deities, and they go on pilgrimage to Hindu sacred sites in Darjeeling, a region of West Bengal. Some have converted to Buddhism and other religions, as well as Christianity, probably to be free of discrimination. This might be true of those living in Bhutan, where there is a Buddhist majority. The Kami people, be they Hindu or Buddhist, need to put their faith and dependency in the God of the Bible. * Pray for the Christian Kamis to be more forthright in sharing their faith. * Pray for increased literacy and access to Scripture in their languages. * Pray for the JESUS Film to be shown in their communities. * Pray for churches to adopt the Kamis and pray for them regularly. http://www.globalprayerdigest.org/index.php/issue/day/2008/09/30View Kami in all countries.